Apple iPhone XR was the best-selling model, but iPhone sales were down 20 per cent in November, claims Counterpoint. Apple iPhone sales were down 20 per cent on an yearly basis for the month of November 2018, though the iPhone XR was the best-selling model, according to a new report by Counterpoint research. The numbers come as Apple has slashed revenue forecast for the first quarter of 2019 (October to December 2018), a rare miss for the technology giant. According to Counterpoint, sale of new iPhone (iPhone XR, XS and XS Max) were down over 20 per cent on year-over-year basis compared to the iPhone 8, iPhone 8 Plus and iPhone X launches in 2017. While iPhone XR was acknowledged as the best-selling iPhone model in November 2018, Counterpoint says that in comparison in November 2017, the more expensive iPhone X was the best-selling model. The iPhone X had almost 50 per cent higher volume compared to the newer iPhone XR, claims the research firm, despite sporting a price tag of $999 compared to $799 for the latter. Apple has blamed the conditions in China and decline sales in one of the world’s most important smartphone markets as responsible for this revenue miss. A lack of upgrades in more developed markets has also contributed to the slump in Apple’s results. 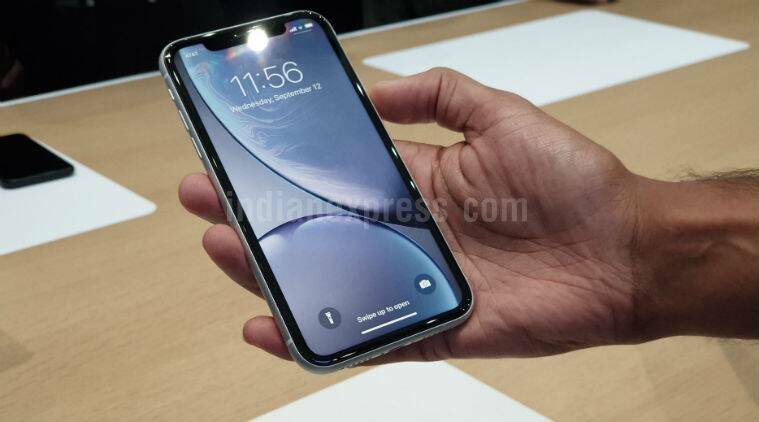 Counterpoint analyst Shobhit Srivastava in his blog post also noted that the iPhones sales were impacted thanks to slower sales in Asia Pacific region, Europe and US. This bit excludes China and India market, where Apple has also struggled. The lengthening of the upgrade cycle was also pointed out as a factor in poor sales of iPhones, especially in markets like US and Europe. Apple CEO Tim Cook had mentioned something on similar lines in his letter to investors. In Asia Pacific region, the decline is being contributed to the higher price, something other analysts have also pointed out. Counterpoint’s data shows that the iPhone XR series outsold XS and XS Max series with the iPhone XR 64 GB being the best-selling iPhone during the month. Apple itself has insisted that the iPhone XR remains a best-seller since it was launched. Keep in mind the iPhone XS and iPhone XS Max went on sale in September itself, while the iPhone XR was only made available in October. However, Counterpoint data also showed that in comparison to the iPhone 8, iPhone XR sales were down 5 per cent. Both the iPhone 8 and iPhone XR are the cheapest devices in the individual lineup, but the iPhone 8 still performed better, even though the iPhone XR packs a newer design, Face ID and comes with Portrait mode supported on the single rear camera, which is missing on the iPhone 8. Counterpoint also compared iPhone XS to iPhone 8 Plus and noted that sales of the newer iPhone were up 3 percent year-on-year. But it looks like the big 6.5-inch iPhone XS Max fared the worst, when compared to iPhone X during the same month last year, as it had 46 per cent decline in sales for November 2018. But Counterpoint notes that cumulative sales of iPhone XS Max were 50 per cent higher till November than that of iPhone X in 2017, but this was due to “the early availability” of the devices. The iPhone X was only launched in the end of November 2017. Counterpoint is predicting that the iPhone XR will continue to eat into the share of the iPhone XS and iPhone XS Max till December 2018, which is not surprising given the high price points the latter two command. The iPhone XR by comparison is more affordable, though at $799 this is still quite expensive. On the China market, Counterpoint says that while sales were steady in November due to the Single’s Day holiday, iPhone XR did not fare up to expectations because of the single camera and lack of innovative features. The price of the iPhone XR also played a role in this, because it is still more expensive compared to other Chinese smartphone options. Counterpoint is predicting that iPhone sales will be down in China in December 2018 as well thanks to the ongoing trade war, and with Chinese companies encouraging employees to buy smartphones from Chinese OEMs. The researh firm also expects older iPhone models like iPhone 8 and iPhone 7 to see a rise in sales in emerging markets.